Last Saturday it rained. All day. It felt just like being back in England. Generally this wouldn’t have been much of a problem, but of course we had planned to go skiing for the day, and had rented a car in anticipation. (To add insult to injury, the rest of the week had been perfect spring weather.) Skiing in the rain is really not the most pleasant way to spend a day so we decided not to go, but the prospect of any other kind of day trip didn’t measure up to the original plans. 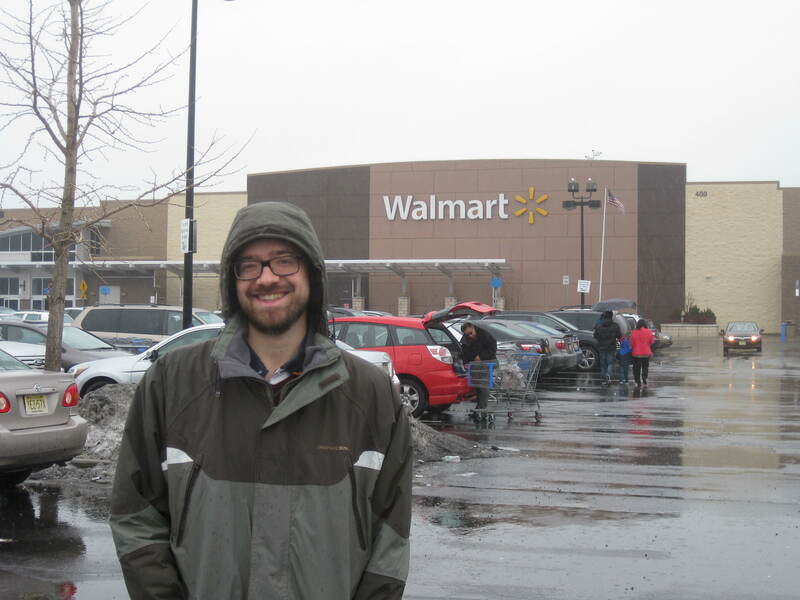 I have no idea why he was so excited to go to Walmart, and I suspect that it’s a lot less interesting now that we have massive superstores in the UK too, but I can think of worse places to be on a rainy Saturday. We certainly managed to stock up on all kinds of cheap groceries and other odds and ends, so it was useful too. After we finished shopping, we had the novelty of driving out of the Walmart car park and into the car park of a restaurant about 500 metres away. This kind of thing always feels very American to us, and we hardly ever get the chance to do it – a fun prelude to lunching like the locals on burgers, fries, and giant glasses of soda. Probably the worst part of the day (apart from the not skiing bit, obviously) was the driving in Jersey City. Roads were confusingly-signposted, epic one-way sections made it difficult to change direction or go back to where we ought to have turned off, lanes merged on and off the highway seemingly at random, and almost everyone drove like a maniac. Fun. This entry was posted in Living and tagged New Jersey, shopping, Walmart by Emma Davidson. Bookmark the permalink.